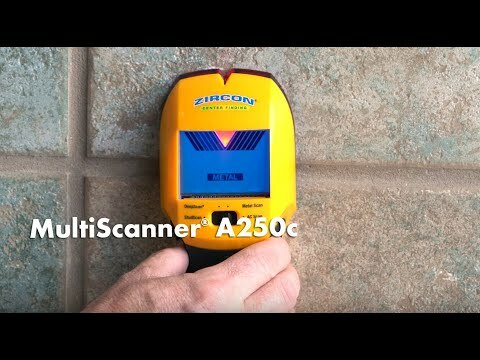 MultiScanner® A250c is an all-in-one tool complete with stud finding, metal detecting, and live AC scanning capabilities. The A250c’s multicolor ColorTrip™ Display eliminates guesswork by lighting green in both stud scanning modes, blue in Metal Scan Mode, and red in live AC Scan Mode. As an added safety feature, the LCD screen lights and flashes red alerting the user of live AC wiring while scanning in StudScan, DeepScan®, and Metal Scan Modes. The SpotLite® Pointer, ultra-bright LCD screen, and audio tone indicate the location of the specified target.